Knit By God's Hand: Trash everywhere!!! I know in my house, my husband thinks NOTHING of it. How do I know? Because I try to recycle where I can & it drives him nuts. & he has no problem throwing everything away. Even clothes that he doesn't like anymore. .... don't worry, I don't let him make it to the garbage with the clothes. I keep a box always by the door for things to give away when a charity calls for a pick up. But I do worry about the earth. I'm the person who cries over cut down trees. Really, I cry. I worry about landfills. How can it continue to hold all the garbage that is created???? I freak out about the air & water & what can happen to it. & I don't think its about living so extreme you can't function in a normal way. I do love that it did force her to live a healthier lifestyle though. Isn't that interesting? You take care of yourself better & you take care of the environment around you better as well. The circle of life I can get down with. What about you? Does this sort of thing worry you? Do you do anything to help the environment or watch your trash usage? What's one thing you are willing to change in the future? I am a huge recycler, re-user, and donater. I hate a lot of trash. Last night Michael finished some dip and said, "I'm just gonna throw the container in the trash so I don't have to wash it" and I was like, "NO!!! I'll wash it." He then washed it himself and pouted the whole time. I was like...I told you I'd wash it... Recycling is so ingrained in me, I can't just throw recyclables away! I definitely worry about things like this too. It's funny because I used to be much more wasteful and Mike really helped me change my ways on this :) I try to recycle, re-use or donate as much as possible. I wish this was something I worried about more. I try to donate my clothes as often as I can though. Nothing made me feel more sad about our planet than being at the beach and seeing all of the trash that would end up on the beach from the water. I know I could do more, but I'm a huge recycler! Guess that earns me a few points, right? I've read a few books about the topic of zero waste, the one that sticks out the most is 'No Impact Man' and I think the topic is fascinating! I added that video to my 'watch later' list. I try to reuse & recycle as much as possible and make an effort to reduce what I use in the first place. With somethings it's almost like a game, 'how long can I make this bottle of shampoo last?'. It makes me sad when I think about how wasteful we all are. I try hard to donate things and save things where I can. We dont have a recycling program where I live and I think that is terrible. Every city should offer recycling, not just the big ones! Hubby and I used to recycle a lot, but I guess we've gotten lax about it. Seldom do it now. Time to get back into that habit, I guess. I recycle, reuse, repurpose, and donate whenever I can. I grew up recycling so it's habit but the rest took a bit of time to incorporate into regular life. It did, though, and here we are. I'm definitely environmentally conscious and I have the same thoughts about landfills. Oh we recycle everything. We even compost some of our foods. It is a good practice for sure. 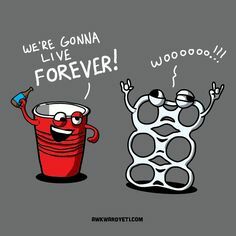 We recycle. We have those huge rolling trash cans that are provided by the company. Our recyclables all filled to the top each week. Our normal trash usually only has one bag inside from the week! We definitely give our clothes to charity.